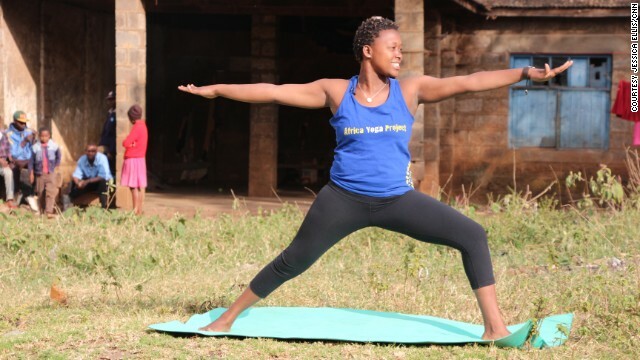 Yoga is spreading across Kenya thanks to the Africa Yoga Project. Even the Maasai tribe is starting to embrace this practice from another culture. Members of the Maasai community in Alasiti village are embracing yoga and participating in classes. The Maasai yoga instructors say the combination of yoga and their lifestyle can bring both mental and physical benefits to their community. However, they say it took a while before the Maasai understood it wasn't about religion. "Yoga will be part of Maasai tradition because the young need to be strong warriors," says Jacob Parit, Maasai warrior and yoga instructor. The Africa Yoga Project has several outreach programs in Kenya's slums, where it teaches orphaned children as well as women living with HIV/AIDS. Margaret Njeri, pictured, gives classes to HIV-positive women. "Yoga is like a medicine," she says. More than 300 classes are being taught every week. Thousands of people flock to the headquarters to learn how to relax and better cope with their lives. "I feel like I have a job that has given me a purpose for life," says Walter Mugwe, instructor with the Africa Yoga Project. "A job that gives me a definition of who I should be in the world, a service for others, uplifting for others." Nairobi, Kenya (CNN) -- There he stands, Mount Kilimanjaro in the background, striking a pose on a purple mat, bathed in the light of dawn. Breathing. Stretching. Opening up his mind -- a group of young children following and copying his every move. 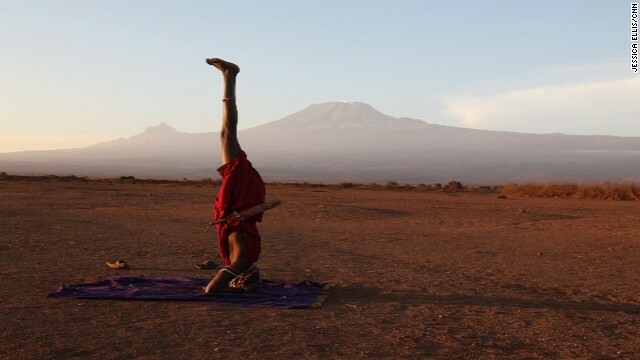 Watching a Maasai warrior practice yoga is a rare sight, but Jacob Parit is not only a warrior in one of Africa's best-known tribes, he's also an instructor with the Africa Yoga Project. "Yoga will be part of Maasai tradition because the young need to be strong warriors," Parit says. "It is a peaceful thing and it brings people together." 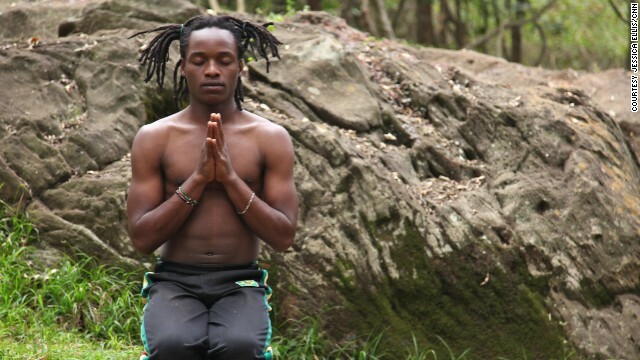 Originating in India, yoga is practiced globally, and is now spreading across Kenya. And it's not only about the practice -- here, yoga is transforming lives, contributing positively to communities and creating jobs. 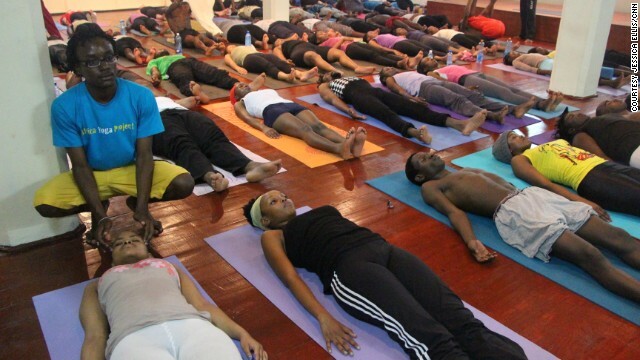 The catalyst for this yoga boom in Kenya is the Africa Yoga Project. Started in 2007, the non-profit organization is the brainchild of American Paige Elenson. "I have been teaching Baptiste Power Yoga for about 15 years and I was on a family vacation here in Kenya in 2006. I saw a group of youth doing handstands. I got out of the car and did handstands with them. That day changed my life," explains Elenson, who saw yoga as a way to create jobs for young people in Kenya. It started as an experiment, mainly in the city slums, to see if it could bring about positive changes and help people to cope with their lives. Today, the Africa Yoga Projects says it has 71 educated and employed yoga teachers, who earn a living wage. It offers more than 300 free classes every week that are serving around 5,000 people. The project is funded by volunteers and donors and is bringing together people from all walks of life. 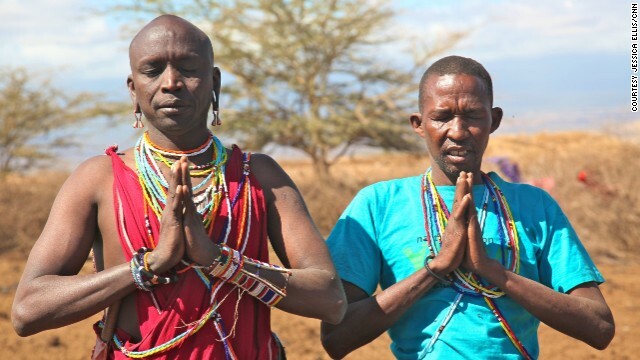 Parit is from the Alasiti village, the first Maasai community to combine their traditional lifestyle with yoga. "(For a) Long time we believed it is like a magic. But after we do it, we realize this is something anyone can do," he says. Parit and the other Maasai yoga instructors believe that the combination of yoga and their lifestyle can bring mental and physical benefits to their community. "Yoga helps me knowing who I am," Parit says. "Every morning when you get out of your bed your body will ask for yoga." Yoga will be part of Maasai tradition because the young need to be strong warriors. In the early mornings and evenings, members of his community wait for his instructions. At night, they are eager to stretch their bodies after a long day of work looking after the livestock, taking care of their houses, cooking and cleaning. "I have been doing it for seven good years and I think I have taught 8,000 to 9,000 people now," Parit says. The yogi in traditional Maasai dress encourages his students: "Reach up, be strong like a warrior." Even in the city, the instructors with the Africa Yoga Project are not limited to yoga studios. Many of the free classes take place in Kibera, Nairobi's biggest slum, where most people live under the poverty line. Rufus Ngugi is one of the deaf instructors working with the project. 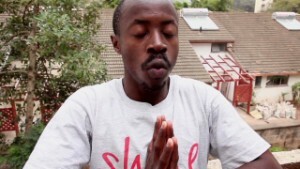 He teaches yoga to a group of orphans in a Kibera center called Fruitful. "Whatever I do, I start by demonstrating," he explains. "I show them how to breathe, I show them the different postures, and in this case I don't even involve a hearing person." Ngugi has been with the Africa Yoga Project for a year now. He thinks the children feel connected to him because of his disability. "These are children who don't have parents, children who have been neglected by their parents," he says. "This really motivated me, touched me because I could relate what they feel because I had the same experience. So that is why really inspired me to teach them." Standing in a circle inside the center, Ngugi stretches his hands up, the small children doing the same. Then, suddenly, they break into a dance. "They call me Michael Jackson because of the different dance moves that I do. I try to give them the best I can. To have them have a good time. To have them forget about life and enjoy it," he says. "This makes me feel good because I can see the future; they can grow up to be good people in society."